Victories in Tuesday’s primaries, upcoming elections and save the date for our Parent Action Conference! We at NYC Kids PAC are thrilled with the primary results from Tuesday night. Seven of our endorsed candidates as pictured above won their primaries and will likely go on to win in November. All of them have exceptional records and stances on supporting our public schools, keeping the cap on charters, putting checks and balances on Mayoral control, and taking progressive positions on the other issues that matter. Public school parents and advocates will have new, energetic and influential friends in Albany who will help lead to real change. We understand that there are many who were disappointed that Zephyr Teachout wasn’t elected Attorney General. Both Zephyr and Tish James were terrific candidates, and both deserved to win, but only one could. 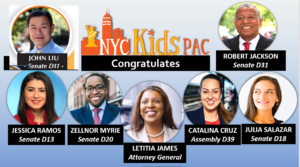 Kids PAC is the only NYC-based PAC that focuses solely on education, and our executive board is made up of parent activists who make endorsements through consensus. As a NYC Councilmember and Public Advocate, Tish earned our endorsement because of her exceptional record in fighting to keep the public in our public schools, whether it be for budget transparency, the rights of kids with special needs, suing the DOE to prevent school closures and charter co-locations, and ensuring that School Leadership team meetings remain open to the public. Given Tish’s record, we are confident that she will continue to battle against corruption and the private interests that would like to undermine our public schools and for the right of parents to be full partners in improving them. We also hope and expect that Zephyr will remain involved in public life, because hers is a voice that needs to be heard. But the election season is far from over. We will soon announce endorsements for the November general elections, which are right around the corner. We’ll also reach out to the candidates running for Public Advocate to replace Tish James as soon as they are announced, to urge them to complete our survey. As usual, we will then decide through consensus who to endorse, after evaluating their responses and their records on public education. Keep tuned. Finally, we are now planning our fourth annual Parent Action Conference to be held on January 19, co-sponsored with Class Size Matters; please save the date! If you have ideas for workshops or speakers, please email us at info@nyckidspac.org with your thoughts. We will update you with more information soon.